Michigan had lost by double digits each of the last two seasons to SMU. In the Championship Game of the 2K Classic benefiting Wounded Warrior Project, the Wolverines made sure three would not be a charm. 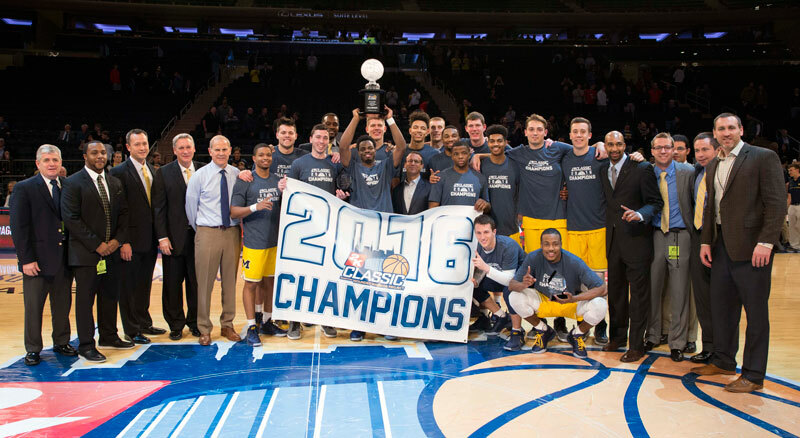 Michigan never trailed and built a lead that peaked at 19 points in taking a 76-54 decision from SMU to capture the 2K Classic title. Derrick Walton, who was held scoreless the previous night against Marquette, led all scorers with 23 points to go along with six assists. Zak Irvin followed his 16-point, seven rebound game from the semifinal win over Marquette with 16 points and six rebounds to earn Most Outstanding Player laurels. Muhammad Ali Abdur-Rahkman had 12 points and joined Walton on the all-tournament team. As a team, the Wolverines shot 27-of-51 from the field while limiting the Mustangs to 22-of-59. SMU received 13 points and nine rebounds from Semi Ojeleye, who garnered all-tournament honors. Ben Moore, Jarrey Foster, and Sterling Brown each scored 10 points. In the consolation game, Pittsburgh trailed by 15 points with 18:48 to play before mounting a comeback that saw the Panthers outscored Marquette 45-27 the rest of the way to emerge with a 78-75 win. Michael Young led all scorers with 30 points to go with eight rebounds en route to all-tournament team honors. Jamel Artis had 21 points and seven rebounds and Chris Jones added 13 points. Andrew Rowsey paced Marquette with 20 points. Sam Hauser and Duane Wilson scored 11 points apiece and Haanif Cheatham had 10 points. In Subregional play at IUPUI, Eastern Michigan received 28 points from Willie Magnum IV in earning a 76-68 win over Gardner-Webb in the first game of the doubleheader. In the nightcap, Ron Patterson had 15 points and T.J. Henderson scored 14 as IUPUI downed Howard, 77-55. On Saturday, IUPUI will faces Eastern Michigan for the title with Howard and Gardner-Webb playing in the consolation match.